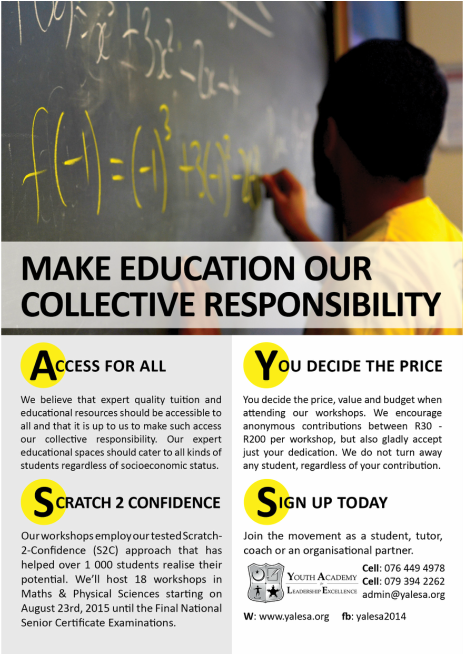 We believe that expert quality tuition and educational resources should be accessible to all and that it is up to us to make such access our collective responsibility. Our expert educational spaces should cater to all kinds of students regardless of socioeconomic status. You decide the price, value and budget when attending our workshops. We encourage anonymous contributions between R30 - R200 per workshop, but also gladly accept just your dedication. We do not turn away any student, regardless of your contribution. Our workshops employ our tested Scratch-2-Confidence (S2C) approach that has helped over 1 000 students realise their potential. We’ll host 18 workshops in Maths & Physical Sciences starting on August 23rd, 2015 until the Final National Senior Certificate Examinations. Download the Timetable for the Workshops Below.